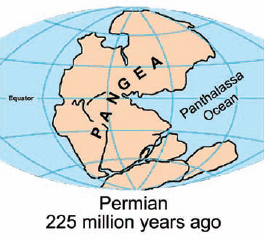 How did fossil evidence support the theory of continental drift? Scientists discovered the fossils of many identical-appearing species on widely separated continents. They had two theories for this. First, they theorized that separate species developed identically across the far-flung continents, a notion that was highly unlikely. The second theory was that the continents had been in contact with each other millions of years ago, and had somehow drifted apart. For example, fossils found in South America were related to those in Australia and Antarctica. These landmasses were in contact sometime in the past, allowing species to roam freely, die, be buried, and become fossilized across these continents. The fossilized remains in the rock layers of the continents drifted with the landmasses, leading to widely separated—but nearly identical—fossils. Hundreds of millions of years ago the seven continents were joined together as a supercontinent scientists now call Pangea. It later broke up into Laurasia and Gondwanaland during the Triassic, and eventually split apart even more (based on a U.S. Geological Survey map).